“Group Therapy” The “Bear” lived up to its reputation and I promised no barbells in the WOD today. 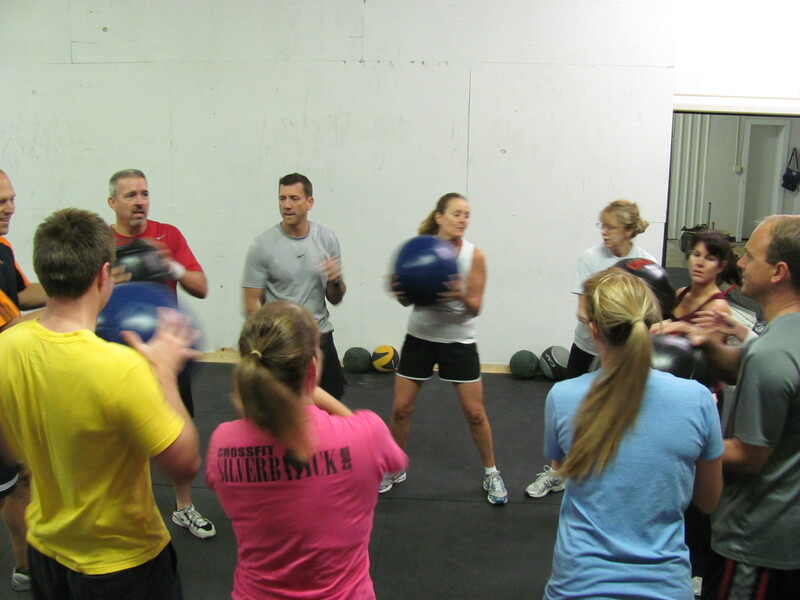 All the athletes form a circle, every third or fourth athlete has a med-ball. Pass the med-ball in the prescribed direction x 1 min then stop and perform squats x 20 (athletes with the ball do goblet squats) all reps must be completed within 1 min. Second round = 22 squats and continues to increase by 2 every round. I believe a version of this was forwarded from CrossFit Katy, thanks guys. 5 am with some sort of Easter Egg theme going. I love “Group Therapy” because it is the only excercise where I’m supposed to use the same weight as the Girl-illas. It was good to finally meet Mac and work out with the 5:30 crew. Set a BS PR at 315 x 3. Bear was perfecting his “no hands” squat. The WOD was good and a struggle at the end. Did all 290 squats. No posts today what’s up with that? At the 4:30 class it was more like “couples therapy.” Cassie and I were the only ones there. We worked out together and Zach was kind enough to join us! The WOD was not too bad especially with my sore thighs from Bear Burnout yesterday. WOD was challenging to the quads after the last few days of CFSB and CFE combined. Matt if Brad is correct then you definitely should be congratulated. I’m happy to have been a sporadic part of your first year. Way to go after the dream brother.